With 420 Dennis, Charly of Amsterdam, the Laugh Mob, Queen Frances, Kendra-The-Fierce and Baldenstoned all assisting in this fast growing event. This begins with the Beard and Dread Stash. How much can you hide in your hair anywhere? Followed by Correct Weight where contestants attempt to fill a baggie with as close to an ounce as possible, 28.349 grams. Seed Sorting, and the crutch and wheelchair obstacle course where contestants will attempt to score a Licence To Care*. And in 2019 we are excited to announce a new event: The Kombi Lift!! 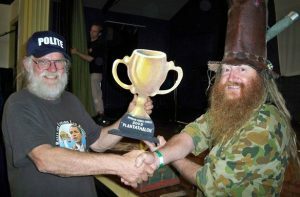 We are seeking Australia’s strongest stoner! * Extremely rare and almost impossible to get in Australia!